This article is part of a series of stories and op-eds initiated by IPS on the occasion of the International Day of the World's Indigenous Peoples, on August 9. UNITED NATIONS, Aug 9 2018 (IPS) - Indigenous peoples, who comprise less than five percent of the world’s population, have the world’s smallest carbon footprint, and are the least responsible for our climate crisis. Yet because their livelihoods and wellbeing are intimately bound with intact ecosystems, indigenous peoples disproportionately face the brunt of climate change, which is fast becoming a leading driver of human displacement. 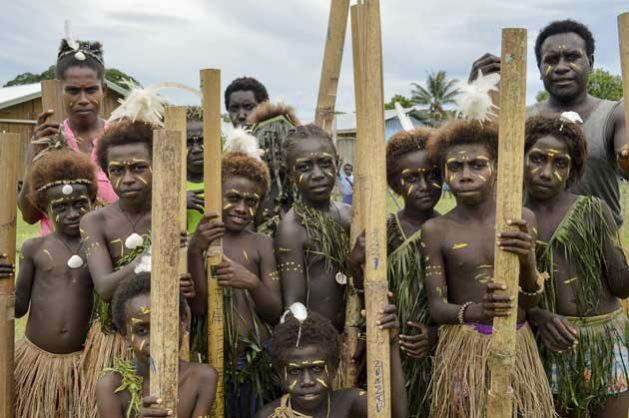 In Papua New Guinea, for example, residents of the Carteret Islands – one of the most densely populated islands in the country – have felt the effects of climate change intensify over recent years. With a high point on their islands of just 1.2 meters above sea level, every community member is now at risk from sea level rise and storm surges. Moreover, the community depends almost entirely on fishing for their food and livelihoods, but the health of sea grass beds and coral reefs has gradually deteriorated from warming waters and coral bleaching. The residents of these islands faced a stark choice – to be passive victims of an uncertain government resettlement program, or to take matters into their own hands. They chose the latter. In 2005, elders formed a community-led non-profit, called Tulele Peisa, to chart their own climate course. In the Halia language, the name means “Sailing the Waves on our Own,” an apt metaphor for how the community is navigating rising sea levels. In 2014, the initiative won the prestigious, UNDP-led Equator Prize, in recognition for their ingenuity, foresight and proactive approach in facing the challenges of climate change, while keeping their cultural traditions intact. Earlier this month, Jeffrey Sachs published an article entitled “We Are All Climate Refugees Now,” in which he attributed the main cause of climate inaction to the willful ignorance of political institutions and corporations toward the grave dangers of climate change, imperiling future life on Earth. 2018 will likely be recorded as among the hottest year humanity has ever recorded. Yet a slew of recent articles highlight that we are not on track to meet the goals of the Paris Agreement. We have not shown the collective leadership required to tackle this existential crisis. Carteret Islanders have been broadly recognized as the world’s first climate refugees, but they are not alone. Arctic indigenous communities are already facing the same plight, as are their regional neighbors from the island nation of Kiribati. According to the World Bank, their plight will likely be replicated around the world, with as many as 140 million people worldwide being displaced by climate change within the next 30 years or so. But the Carteret Island leaders are more than just climate refugees. They have done something precious few political leaders have done to date – they recognized the warning signs of climate change as real and inevitable, they took stock of their options, and they charted a proactive, realistic course for their own future that promised the most good for the most people. Therefore, they could also be called the world’s first true climate leaders. Let’s hope that our world’s politicians and CEOs have the wisdom, foresight and fortitude of the elders of Carteret Islanders. Because like it or not, we will all be sailing the climate waves on our own, with or without a rudder and a plan. This makes no sense. Indigenous people do not make up five per-cent of the world’s population. Indigenous Chinese, Brits, Germans, Egyptians, Russians etc. This article uses the definition of indigenous peoples embodied here: https://en.wikipedia.org/wiki/Indigenous_peoples, and here https://en.wikipedia.org/wiki/Declaration_on_the_Rights_of_Indigenous_Peoples. More information is available here: https://stories.undp.org/10-things-we-all-should-know-about-indigenous-people. Thanks Jamie. That’s an odd definition, not used in the world at large. African countries often have policies of indigenisation which means favouring local ethnic groups rather than more recent arrivals. But it has nothing to do with lifestyle. True – definitions of indigenous peoples do vary from country to country. UNDP uses the UN Declaration on the Rights of Indigenous Peoples as the operating framework – please see: http://www.un.org/esa/socdev/unpfii/documents/DRIPS_en.pdf.